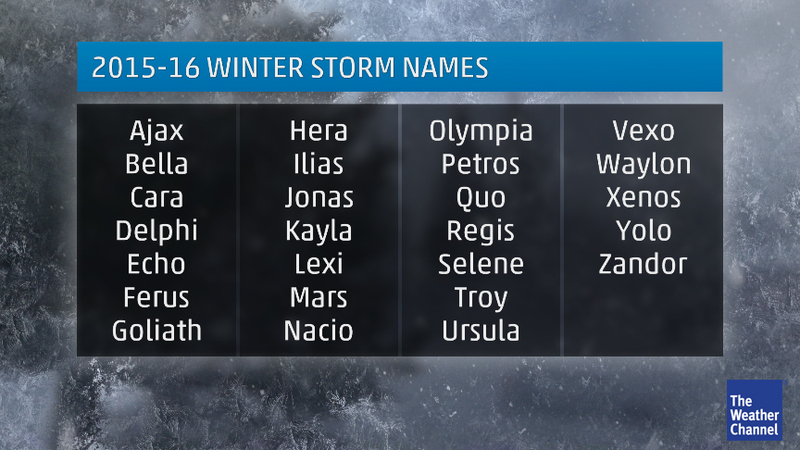 Even though there’s still a little contention over their doing so, The Weather Channel has released their list of 2015-16 Winter Storm Names with explanations of the names. It also doesn’t hurt that the names are short and easily applied to a hashtag for social media sharing. The names are selected by the Bozeman, Montana1, High School Latin class, then reviewed and/or edited by The Weather Channel for marketin–ease of use and pronunciation. Most notable? Yolo (yo-lo) – An acronym for you only live once. The modern version of the Latin phrase, carpe diem, which is usually translated seize the day. I’m sure “them internets” will be all aflutter over that one, although it’s already been added to OxfordDictionaries.com, so who am I to judge? I love snow in winter… perhaps one pretty snowfall and then one serious-to-major storm and then that’s about it. Much more beyond that and DC stores run low on supplies, restaurants start closing, people lose their minds and I get stir crazy. If I had my druthers, winter would be something best observed from a warm remote hideaway, most likely via Netflix while binge watching Fargo or something. 1 In the Star Trek universe, Bozeman, Montana will be the site of Human-Vulcan first contact in 2063. So, y’know, mark your calendars for that! Previous story Barkhaus: Why So Serious?! I’m still snickering at YOLO. Wait, love the post, really I do, but am going to be laughing about YOLO. Strangely don’t think it will make a bump on the interwebs, because well it isn’t outrageous enough to churn up the old “outrage machine” but what do I know?!? As much as I want to see them hit the Q-Z stride, I’m also hoping maybe we don’t have enough weather events to qualify as storms. But seriously for serious, I really want to see Weather Channel hosts saying “Winter Storm Yolo”. How fatalistic would that be? well they usually never get that far ~ Jim Cantore standing on a pile of snowplowed mountain yelling YOLO. That would be a gifable moment if we ever had one. I now have WordPress on my list. Hit “send” on the little widget thing in the bar at the top 4x on this, copied it & pasted & came over here when it was acting a fool. Just to find it had indeed posted it. They better not play with me today.